« Day 478 In Beijing: Guns and Interviews. Day 479 In Beijing: The Xian Wall, Part 1. 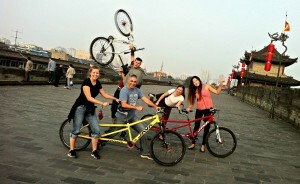 The gang with our bikes. From left: Jill, Phil, me, Eleni and Annie. Jill and I have been to the Great Wall of China two different times. We are actually going again in about one week. We will be going with a bunch of students from Eseune Business School and our dear friend, Nuria. I actually met Nuria when I first moved here and went salsa dancing. She’s from Bilbao, Spain, and a wonderful person. She works at the school and invited us to come along with the new students and stay at a farm house. We immediately accepted and thought this would be a wonderful way to spend the Autumn Holiday in China. However, since we were still in Xian, at the conference, we decided to check out the Xian Wall. Now, it isn’t as long as the Great Wall, obviously, and is actually inside the city itself. It runs about 16 kilometers long and is about 50 feet high. It is also formed in the shape of a rectangle that protected much of the old city. Most of the houses and businesses inside it are the “old style” but they are being torn down, like so much of China, to build new and “civilized”housing which is not very interesting or exciting. This is the way of progress, I guess, and it makes us quite sad. 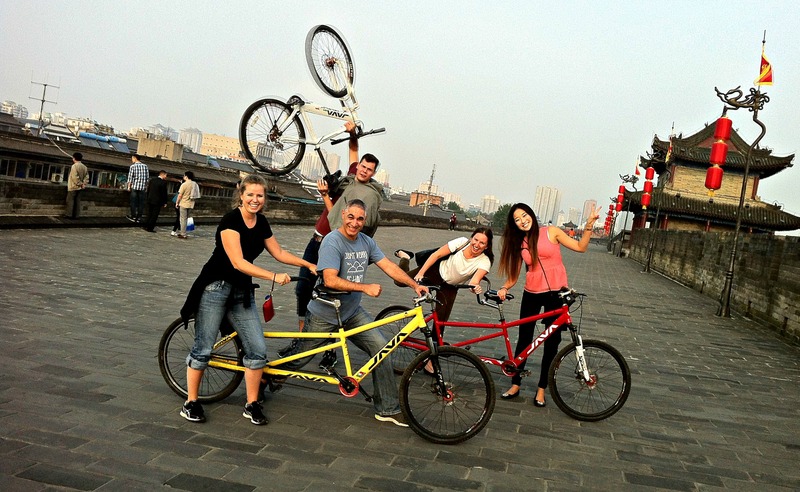 We ended up going with a bunch of friends, from many different countries, and riding bikes on top of the wall. We had been told that it had rained for 2 weeks straight in Xian, and the skies had been hidden by “fog” that whole time. A word to the wise, when a Chinese National says “fog” they mean smog but they don’t want to admit it. Trust me, it is smog. Tonight was absolutely gorgeous and we were able to take a lot of fantastic pictures with our new friends. Phil is the tall guy and he is from Austria, Eleni is blond and from New Zealand, Annie is a brunette and from Sweden.